Chitwan is popular for both cultural and natural diversities. Among many other tourism activities, Chepang Hill Trekking has its own significance. This trekking trail leads you through the unexplored beautiful hillsides of Chitwan. This newly developed Trekking trail is just about 80 km from Kathmandu. Besides the natural beauty, the trail offers cultural highlights of one of the indigenous communities of Nepal. This area is home to the Chepang people who lead a semi-nomadic life and have rich cultural traditions. Thus, to visit this marginalized group is to add some new form of insight on people and their way of life. You are more likely to enjoy their primitive culture, their festivals, norms and, values. 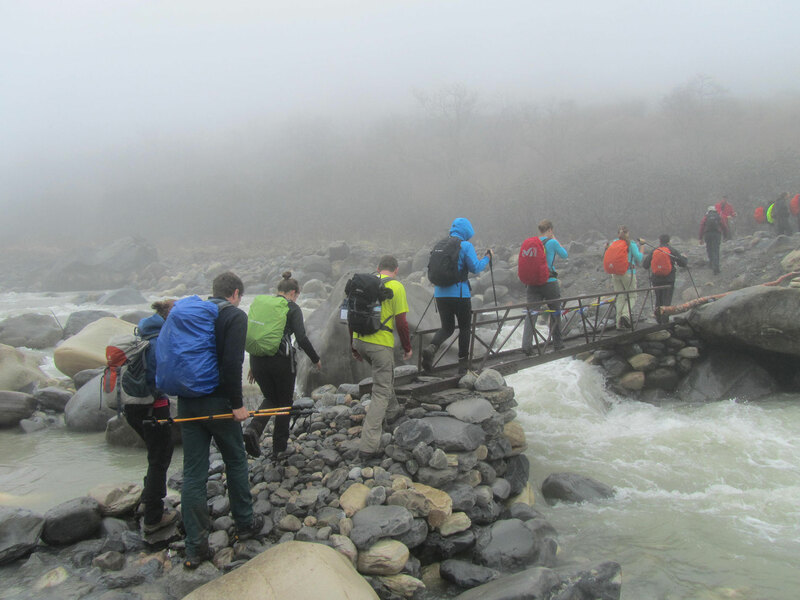 The trail sometimes provides you with philanthropic satisfaction as it is designed to lead through the homeland of Chepangs and their remote villages in order to generate income possibilities for them and to raise awareness about the Chepang culture among foreign visitors and Nepali people. After breakfast we will start for sightseeing tours around in Kathmandu valley, The sightseeing program is focused to introduce some highlights and UNESCO World Heritage sites of Kathmandu such as Durbar square, Swoyambhunath, Pashupatinath and Bouddhanath. we start our journey from Kathmandu by bus. After driving 3 hrs, we reach Hugdi. We take our lunch at Hugdi. The trek starts from Hugdi. Trekking for about 4-5 hrs, we reach Hattibang. We spend the night at Hattibhang in home-stay. The second day of our trek starts from Hattibhang and ends at Jyandala penetrating other Chepang settlements such as Jautesh, Changa and Dinglang. It would be our pleasure to observe the complete Chepang settlements and their culture and evening enjoy with local family. Trekking from Jyandala to Siraichuli is an outstanding experience. We would be able to view mountain ranges, sunrise and sunset at Siraichuli. Moving ahead from Siraichuli to Chisapanitar is also a splendid one. We would be fortunate enough to watch varieties of birds. Today we descend to Shaktikhor from Gadi. We would visit Chepang museum and experience the culture of Chepang community. In the evening, the local people will perform cultural programs on request. After having lunch at Shaktikhor, we start our trek to Majhbang. While on the trek, we visit the Sinti waterfall and caves at Sinti. Trekking from Siddi to Majhbang offers village tour and explores Chepang cultural. After breakfast, it is the final day of our trek ends at Sauraha, Chitwan which takes about 5 hrs, we will trek through, sal forest, village, and afternoon, village tours in Chitwan. We will spend all our day in this unique place in the mids of jungle activites like a jungle drive, safari on an elephant back and a jungle walk. Dinner in the evening and cultural introduction to the Tharu, which is the largest and oldest ethnic group of the Terai region, living in villages near dense jungles in regions that were isolated over the millennia, allowing them to develop a unique culture. In the morning after breakfast, we will be doing canoe (this kind of rafting is on shallow water with no rapids is meant to not disturb the nature and to view Crocodiles, birds and seek possibilities to watch tigers) after Lunch Cycle tour to 20,000 lake area to explore more wild animals. An early morning, we go for one hours jungle walk to explore birds and after breakfast we drive to Pokhara (175km). It is although a scenic route that offers greeneries, rivers, villages, farms and beautiful mountain sceneries. In the afternoon, we reach Pokhara, the second largest touristic city of Nepal. You can wander during the evening hours in the colorful streets alongside the lake and have a dinner in one of the many restaurants along the lake side. After breakfast, we start our cultural tours around pokhara, Pokhara is famous for its magnificent views of Dhaulagiri, Manaslu, Machhapuchhare, the five peaks of Annapurna and other mountain range. It is the starting point for all the adventurous trekkings. Pokhara is also called the city of lakes and has numerous beautiful lakes and mysterious caves. We will explore the most accessible and beautiful of it, Fewa Lake during the afternoon -also by taking a boat. Pokhara is also particularly interesting because of the many underground caves and wild waterfalls within walking distance located to the south, afternoon explore the city and relax. Today after breakfast, we take a small backpack and leave our Hotel for one night and go to Sarangkot for a spectacular sunset and sunrise in the Himalayas! The trail goes up steeply on a partially unpaved road. Sarangkot is nearly 1600 meters and marks the start for the walk up along the green slopes to the highest viewpoint. The climb is tough due to many steps, but the reward awaits you there. Above is also our Sherpa hotel with a completely unobstructed view of the snow-capped Himalayan peaks. Early in the morning we, climb up to the view point for the magic sunrise that is spectacular and can not to be missed! The Himalaya at its best will unfold its beauty to you. Then return to hotel pack up our bag then we head our walk down to Pokhara, after we begin the short trek (2-3h) which brings us along the rice terraces and dense forests all the way down to Pokhara! The local farmers and their children are always interested in a little chat. At the end of the afternoon we reach our hotel for one last night in Pokhara. After breakfast the driver takes us back to Kathmandu where we offer the possibility to do a (safe) 3 hours rafting tour with our own Lost Paddle company that not only offers a very thrilling river rafting, but also an included camping lunch at the riverbank! No prior experienced needed to participate in this adventure and all ages allowed on board! After the rafting we will continue our drive to kathmandu. Today we explore ancient temples and religious shrines of the two medieval kingdoms, namely: Bhaktapur and Patan. This trip takes you into a kind of mystical history where the past still remains alive in the present, tradition tirelessly repeats itself into a culture that remains seeped into an ancient history created by the kings of past generations and religious doctrines are strictly adhered till this very day, attractive prospect of this trip is cultural tour to the major cultural heritages and temples in Bhaktapur and Patan. One day mountain bike trip rich in culture and beautiful scenery as we explore the Kathmandu Valley and visit Machhendranath temple and the ancient Newari towns of Bungamati, Khokana, Champi and Chapagaon. After an early breakfast, we ride through the back streets of Kathmandu and out past green fields to Bungamati. This ancient town dates back to the 7th century and has a rich history of art and architecture. In Bungamati we visit the Machhendranath temple, a fine example of Newari architecture. From Bungamati we descend on a rough track and then enter the village of Khokana on a wide, cobbled street. We can’t miss the Shekali Mai temple in the middle of the street. From Khokana we head back up the same track to Bungamati and then turn south, heading up a jeep track through rich forest to the small village of Champi. Champi affords a beautiful view of the southwest section of Kathmandu Valley. A rough section of downhill and uphill for 15 minutes brings us to the village of Chapagaon, where we stop south of town to visit the Vajra Varahi temple nestled in a sacred grove of trees. From Chapagaon we follow a jeep track that takes us up and down to Baragaon village, and then back to Kathmandu along the Godawari road. Kathmandu is the obvious place to do some shopping on your last stop before leaving the country. Traditional souvenirs and curios, you won’t have to go far; street vendors and shops sell them wherever there are tourists. Vendors in Basantapur Square and Thamel flog vast arrays of Tibetan-style curios.